Helping Hands Hawaii employee Irene Nunes assists a customer at the Community Clearinghouse in Kalihi. Donated goods stored in the warehouse are given to qualifying families in need. Most of the people who come to the Community Clearinghouse to get free clothing and household items are usually "the working poor (who) are doing everything they possibly can and still not making it," says project director Maria Chomyszak. "They're not homeless, and it's not that they're lazy. They are making minimum wage and it's not enough," she said. 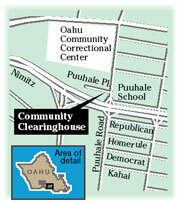 The clearinghouse, a project of Helping Hands Hawaii, is working in conjunction with the Star-Bulletin's annual Good Neighbor Fund to help the needy during the holidays. Chomyszak estimates that the number of people coming to the clearinghouse this year has increased about 25 percent over last year. From January to the end of October, she said the clearinghouse has helped 2,100 families (about 9,000 individuals) with material goods, and 2,300* families with financial help. Families may receive a maximum of $500 for emergency rent, gas and utilities once a year, she said. The most requested material items include clothing, beds and bus vouchers. 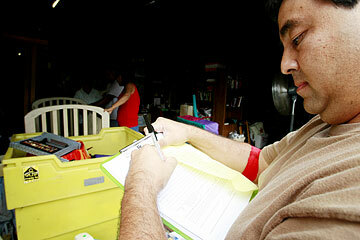 Scott Miyamoto fills out a donation form at the Community Clearinghouse. Miyamoto has donated to the clearinghouse for the past seven years. One of the families applying for aid from the Community Clearinghouse's Adopt-A-Family program is Angela Cunningham's. The Waianae family includes a disabled father, four children and three foster children belonging to Cunningham's sister. Cunningham said she has been the legal guardian of her sister's children for seven years, and that the family is surviving off the foster kids' stipend from the state. Cunningham said she was laid off from her job as a cashier at Kmart a few years ago, and has been unable to find reliable child care so she can get a good job. The youngest child, 8, is hyperactive and has an impulsive behavior disorder. She is reluctant to leave him in the hands of an inexperienced caregiver, Cunningham said. Her husband, a diabetic who has trouble walking and controlling his weight, does not have disability insurance, she said. The former construction worker was laid off several years ago. 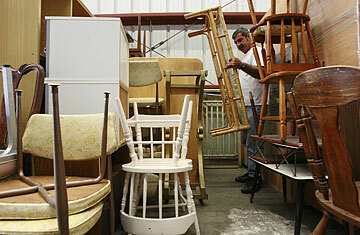 Volunteer Vince Santarone pulls out a rattan-and-glass coffee table for a Community Clearinghouse customer. He is really depressed because "he feels useless and is not able to provide for us," she said. "I'm so afraid that our family may not survive; it's so stressful trying to hold it all together." With their rising rent, utility and car insurance payments, "it's really been a struggle," and she sees no way out of their rut. Cunningham added, "I don't want to depend on my parents" for help. "I told the children: Don't be disappointed if you don't see anything under the tree this year. But I really want to get something for them. It's hard for children to understand they can't have certain things that they used to be able to have." Clothing and footwear for the children are the most needed. School supplies and assistance with gas and utility bills would also be appreciated. In spite of the hardships, Cunningham said she is just "blessed to have a roof over my head, or we'd be living on the beach." » A Good Neighbor Fund story on the Community Clearinghouse, appearing Dec. 3 on Page A17, incorrectly said 23 families have been helped financially this year. The correct number is 2,300 families.